Never have East and West come as close as they are today, yet we are still baffled by one another. Is our mantra "To thine own self be true"? Or do we believe we belong to something larger than ourselves--a family, a religion, a troop--that claims our first allegiance? Gish Jen--drawing on a treasure trove of stories and personal anecdotes, as well as cutting-edge research in cultural psychology--reveals how this difference shapes what we perceive and remember, what we say and do and make--how it shapes everything from our ideas about copying and talking in class to the difference between Apple and Alibaba. As engaging as it is illuminating, this is a book that stands to profoundly enrich our understanding of ourselves and of our world. GISH JEN is the author of four novels, a book of stories, and a previous book of nonfiction, Tiger Writing. Her honors include the Lannan Literary Award for fiction and the Mildred and Harold Strauss Living Award from the American Academy of Arts & Sciences. She teaches from time to time in China and otherwise lives with her husband and two children in Cambridge, Massachusetts. "What a delightful exploration of ideas about how culture affects notions of the self. In her trademark lively and witty prose, Gish Jen not only limns non-Western views of the self but questions whether the Western self is really a natural way to be. A powerful, provocative work." —Michael Puett, the Walter C. Klein Professor of Chinese History at Harvard University, and author of The Path: What Chinese Philosophers Can Teach Us About the Good Life. "Gish Jen draws on personal experience, interviews with experts, and her astute reading of both literature and social science to illuminate the crucial question of self in culture. Misunderstanding East-West differences can cost us in every way we know how to measure: in money, friendship, education, in the balance of power, and the fate of the planet. 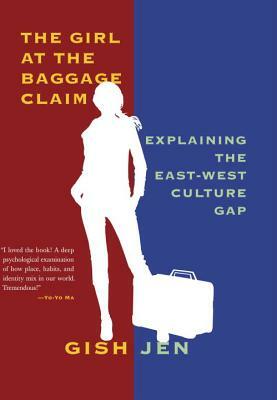 The Girl at the Baggage Claim is remarkable and fluent but, most of all, essential." —Sherry Turkle, the Abby Rockefeller Mauzé Professor of the Social Studies of Science and Technology at MIT, and author of Reclaiming Conversation: The Power of Talk in a Digital Age. "A beautifully observed book with a perfect, light tone, The Girl at the Baggage Claim poignantly captures the personal tussle between independence and interdependence so many of us are caught in. A must read for anyone navigating the East-West divide." —Priya Natarajan, Professor of Astronomy and Physics at Yale University, and author of Mapping the Heavens: The Radical Scientific Ideas That Reveal the Cosmos.